Women's and Gender Studies departments and programs are undergoing rapid transformation, creating the need for a comprehensive and accessible introductory textbook that addresses the current state of the field. 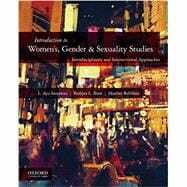 Introduction to Women's, Gender, and Sexuality Studies: Interdisciplinary and Intersectional Approaches is the first text to reflect the exciting changes taking place in this field. Emphasizing both interdisciplinarity and intersectionality, this innovative mix of anthology and textbook includes key primary historical sources, debates on contemporary issues, and recent work in science, technology, and digital cultures. Readings from a range of genres-including poetry, short stories, op-eds, and feminist magazine articles-complement the scholarly selections and acknowledge the roots of creative and personal expression in the field. While the majority of selections are foundational texts, the book also integrates new work from established scholars and emerging voices to expand current debates in the field. The text is enhanced by thorough overviews that begin each section, robust and engaging pedagogy that encourages students to think critically and self-reflexively-and also to take action-as well as supplemental online resources for instructors. L. Ayu Saraswati is Associate Professor of Women's Studies at the University of Hawai'i at Manoa. Barbara Shaw is Assistant Professor of Women's, Gender, and Sexuality Studies at Allegheny College. Heather Rellihan is Professor and Coordinator of Gender and Sexuality Studies at Anne Arundel Community College. Reading 51: Esra Özcan, Who is a Muslim Woman? Reading 54: Riki Wilchins, Angry Intersex People With Signs!